MarkForged is a US based startup that is taking the 3D printing industry to a new level with its Mark One, the first printer that allows carbon fiber 3D printing using the additive manufacturing technology (What Are the Types of 3D Printing Technologies?). But Will it make the desired change? Until today, the 3D printing was limited to rapid prototyping due to the obstacles that prevent taking it to the mass production stage. While there are different 3D printing technologies such as stereolithography, fused deposition modeling, laser sintering and material extrusion, each 3D printing technology face different level of barriers to take it out of the prototyping stage such as the relation between the cost and strength of the 3D printed material. Choosing high strength materials goes up with the cost dramatically. The new carbon fiber 3D printing technology can provide a solution for the problem as it can produce printed products that can resist pressure and used in parts like bicycles and airplanes. Furthermore, the carbon fiber 3D printing can be used to easily replicate existing parts created from different materials, which is not available in other production processes. 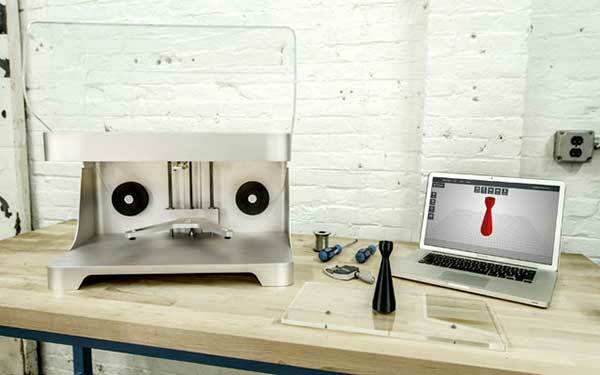 MarkForged is a small startup opened in 2013 by the MIT-educated aerospace engineer Greg Mark. The initial idea was to create a n open source 3D printer that changed later to ensure more reliable process and control over the production. 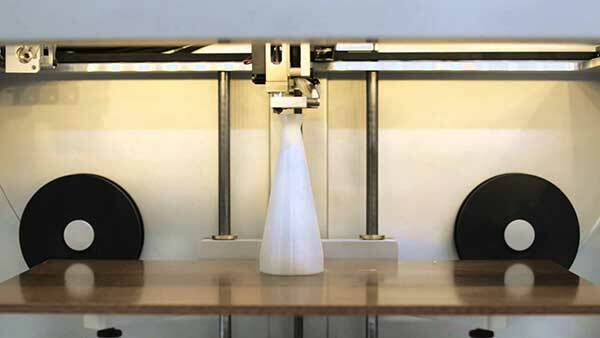 The Mark One 3D printer uses carbon fiber in a thermoplastic resin. Unlike the other 3D printer, Mark One has two print heads, the first one extrudes polyamide (nylon) or polylactide resin (PLA), and the other head extrudes towpreg that can be carbon or glass (What are the Types of 3D Printing Materials?). The 3D printer extrudes carbon filament coated with special thermoplastic resin in a FDM-like process, and places the towperg and resin on x/y dimention plane as multiple thin layers of 200 microns. The models for the canon fiber 3D printing process can be done using any CAD programs such as SolidWorks (List of Free Software for 3D Printing). The Mark One 3D printer with actual printed carob fiber model. The Mark One print size is currently limited to 305mm x 160mm x 160mm with high layer resolution of 100 Microns for the Fused Filament Fabrication and 200 Microns for the Composite Filament Fabrication. The 3D printer supports both STL and OBJ files and the models can be sent to it using WiFi, USB or SD Cards. The printing process using the Mark One two head. The Mark One 3D printer is providing a new initiation to overcome the obstacles of 3D printing especially with the strength factor by using the carbon fibers as a printing filament. MarkForged has more challenges regarding the cost and th sprinted size that they should address in the next versions of the 3D printer.